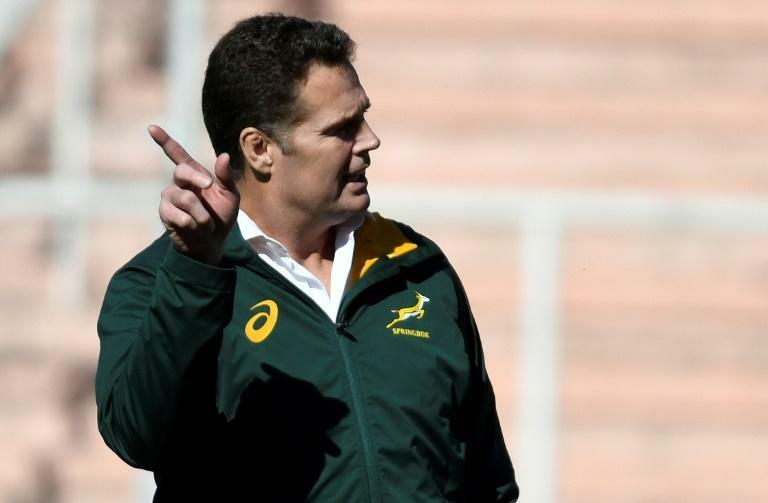 South Africa coach Johan "Rassie" Erasmus admitted Monday his job may be on the line against the All Blacks this weekend after two straight defeats in the Rugby Championship left his six-month tenure in serious jeopardy. South Africa head into Saturday's match on the back of losses to Australia and Argentina, with memories of a 57-0 drubbing the last time they played in New Zealand still raw. "Probably just for me to survive it's fairly important, but that's beside the point," he told reporters in Wellington. "If we can beat the All Blacks here, everybody will think we have a realistic chance of winning the World Cup next year. People will say there's growth." The former Test flanker said the recent losses -- and the Springboks slipping to seventh in the world rankings -- meant he was facing pressure from South Africa's "ruthless" fans, but his main aim was to ensure the Springboks were in better shape than when he took over. He has also vowed to speed up the integration of black players into the national side to reflect demographic realities in South Africa, and in June named flanker Siya Kolisi to the captaincy -- the first time a black South African had ever led the Springboks. "If I'm here or not, I want the next coach who goes to the World Cup to have a squad who's representative of South Africa, who's got enough experience, who's gone through tough times in New Zealand and Australia," he said. Erasmus conceded facing the All Blacks was daunting but said it was a chance for his young players "to show what we have". "This is the ultimate test to see where we are. Did we actually improve in the last six matches or are we getting worse?" "He's flying back today to get scans and stuff. We're not going to get a replacement in for him," he said. "He's definitely out for this weekend."